Thanks for joining us for SCMEA 2018! 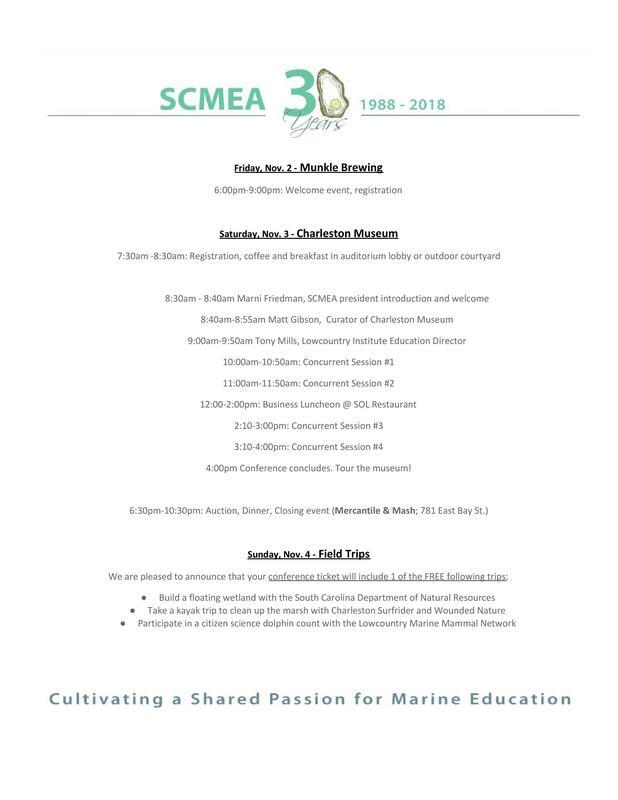 Follow us on Facebook to learn more about SCMEA 2019! Did you know that the history of gift giving to mark anniversaries has been traced back to ancient Rome and gained prominence in the late 19th century? Our special gift to you on this 30th anniversary? Pearls of knowledge! Let’s celebrate all that marine educators have accomplished over the past thirty years and the exciting innovations that await. This November, like minded individuals- classroom teachers, researchers, informal educators, and young professionals will flock to Charleston, South Carolina. This two day conference will include an engaging keynote lecture, hands-on sessions, social events, and a day of field trips. We hope to SEA you this November for a weekend of professional development, idea sharing and comradery!